Background: Rhabdomyosarcoma (RMS) is not uncommon in the head-and-neck region. The nonspecific symptomology mimicking benign or inflammatory lesions result in delayed diagnosis, often in advanced stage, mandating multimodal therapy. Moreover, this delayed diagnosis may contribute to poor outcomes. Objective: The aim of this study is to share our experience in managing RMS affecting head-and-neck region. Materials and Methods: This was a retrospective review of six cases treated at a tertiary care institute. Results: Four cases diagnosed to have RMS of the paranasal sinus, one case involving the temporal bone, and one case with tumor presenting in the nasopharynx underwent treatment. Spinal metastasis was detected in two patients. A 5½-year-old child presenting with RMS temporal bone had the longest period of follow-up. Conclusion: This paper presents a series of six such cases that were treated by the senior author. Embryonal RMS of the temporal bone survived for more than 7 years and is on follow-up. Alveolar variant of RMS has a poor survival of >3 years in our series. Rhabdomyosarcoma (RMS) is an aggressive malignant tumor of mesenchymal origin. Data from hospital-based cancer registers across seven cities in India revealed an incidence of 1%–4.5% of all childhood malignancies. They can affect any organ in the human body; however, 40% manifest in the head-and-neck region. Clinical manifestations of RMS in the head-and-neck region often mimic that of inflammatory or benign diseases, resulting in delay in actual diagnosis and often in advanced stage of the disease. In this case series, we are sharing our experience in managing the six cases of RMS in the head-and-neck region. Along with the analysis of clinicopathological and prognostic factors in these cases, we have discussed the relevant nuances in management of these cases from the recent literature. It is a retrospective review of hospital records and previous studies between 1998 and 2018, at a tertiary care hospital. All the cases of RMS involving head-and-neck region operated by the senior author were included in the study. The demographic and clinical features have been tabulated. Along with survival analysis, the prognostic factors have also been described. All six cases were considered for both demographical and survival analysis. All cases of RMS of the head and neck were diagnosed in children, adolescents, and young adults except one. The median age at diagnosis was 20 years. They were predominantly seen in female with M : F ratio of 1:2. Four out of six cases were involving the nose and paranasal sinus region of which, one had intracranial extension and remaining one case each involving the nasopharynx and the temporal bone. Histopathologically, all the cases were of alveolar variant except for the temporal bone RMS which was of embryonal type and the one involving the paranasal sinus was a spindle cell sclerosing variant. All patients were treated with a multimodal therapy consisting of surgery, chemotherapy, and/or radiotherapy. The surgeries performed include craniofacial resection and reconstruction, faciocranial resection, orbital exenteration, neck dissection, and KTP laser excision depending on the site and extent of the disease. Out of the six patients, two patients developed spinal metastasis of which one succumbed to the disease and the other patients lost to follow-up. Although the longest period of follow-up was 7 years in one patient, considering the fact of heterogeneous follow-up data with majority being lost to follow-up, the detailed survival analysis was not calculated. The details of the patients included in the study are tabulated in [Table 1] and [Figure 1], [Figure 2], [Figure 3], [Figure 4]. About 41% of all pediatric RMSs occur in the head and neck. However, this series included only one pediatric case presenting with lesion in the temporal bone. No gender predilection was noted in a surveillance conducted from 1972 to 2007. The three main clinical subtypes of RMS within the head and neck are orbital, nonorbital parameningeal (including the sinonasal region), and nonorbital nonparameningeal. Parameningeal sites confer a significant risk of the central nervous system dissemination and unfortunately are often unresectable by the time of diagnosis. About 41%–51% of head-and-neck RMSs account for the parameningeal site, including nose, paranasal sinuses, nasopharynx, middle ear, infratemporal fossa, and pterygopalatine fossa. Parameningeal RMSs have the worst outcomes as these lesions often invade critical anatomic structures, precluding complete resection. This series also showed a poor outcome among for the parameningeal subsites. This series mainly comprised young adult individuals with alveolar variants. The alveolar variant is commonly seen in the mean age group of 15–20 years and has a poor prognosis due to its propensity for distant metastasis., Pediatric RMSs affecting the temporal bone are considered to be aggressive neoplasms by virtue of their proximity to vital structures, intracranial extension, and potential to involve the meninges. However, the 5½-year-old child with temporal bone RMS had a favorable outcome owing to its embryonal variant [Figure 4]. Intracranial extension is unfavorable especially when the age is more than 10 years. Prognosis and 5-year disease-free survival rate depends on the factors such as age, stage, histological type, and tumor site. The 5-year disease-free survival varies from 31% to 87% in pediatric RMS. In nonmetastatic RMS, the estimated 5-year overall survival rate was 88% in embryonal type and 72% in alveolar type. In our study, we had one patient who was treated for embryonal variant of RMS of the temporal bone surviving for more than 7 years and is still under regular follow-up. Its parameningeal location contributes to cerebrospinal fluid dissemination. Hence, early diagnosis and multimodal management are important in reducing mortality and morbidity. Imaging studies such as computed tomography (CT) scan, magnetic resonance imaging, and positron emission tomography-CT can help in localizing the site of the tumor, extent, and stage of the disease. Treatment requires a multimodal combined approach that includes surgery and chemotherapy with/without radiotherapy. Surgery should be aimed at complete resection of the tumor at the primary site while considering major functional and cosmetic defects. 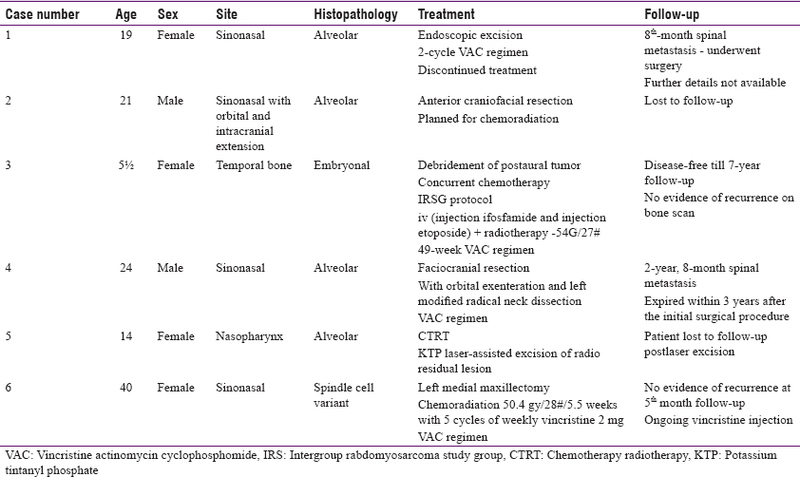 The combination chemotherapy for metastatic alveolar RMS includes vincristine, adriamycin, and cyclophosphamide alone without concomitant radiotherapy. External beam radiation therapies such as intensity-modulated, proton beam radiotherapy and brachytherapy can reduce long-term sequel when the resection margins are positive. The clinical response of the disease is determined by the extent of the primary tumor, histology, and age of the patient. The development of distant metastases is associated with worst outcome, specifically a 16% disease-specific survival at 5 years. RMS of the head and neck, a rare malignant tumor, has a very poor prognosis, more in adults than in children. A multimodal treatment including chemoradiotherapy which is the mainstay of treatment along with surgery wherever possible without compromising the functional and cosmetic outcome is the line of management. In our study, we found that endoscopic approach wherever possible provides better functional and cosmetic results without recurrence at the primary site. It is important to keep in mind the possibility of distant metastasis. Panda SP, Chinnaswamy G, Vora T, Prasad M, Bansal D, Kapoor G, et al. Diagnosis and management of rhabdomyosarcoma in children and adolescents: ICMR consensus document. Indian J Pediatr 2017;84:393-402. Nayak DR, Balakrishnan R, Shahab AS, Rao L. Alveolar rhabdomyosarcoma of paranasal sinus with cervical metastasis – A case report. Indian J Otolaryngol Head Neck Surg 2000;52:162-5. Hu J, Liu S, Qiu J. Embryonal rhabdomyosarcoma of the middle ear. Otolaryngol Head Neck Surg 2002;126:690-2. Turner JH, Richmon JD. Head and neck rhabdomyosarcoma: A critical analysis of population-based incidence and survival data. Otolaryngol Head Neck Surg 2011;145:967-73. Dilger AE, Schneider AL, Cramer J, Shintani Smith S. Rhabdomyosarcoma of the paranasal sinuses initially diagnosed as acute sinusitis. Sinusitis 2017;2:2. Ahmed AA, Tsokos M. Sinonasal rhabdomyosarcoma in children and young adults. Int J Surg Pathol 2007;15:160-5. Donaldson SS. Rhabdomyosarcoma: Contemporary status and future directions. The Lucy Wortham James Clinical Research Award. Arch Surg 1989;124:1015-20. Sarkar D, Ray S, Saha M, Chakrabarti P. Alveolar rhabdomyosarcoma with multiple distal metastases. A case report and review of literature. BMJ Case Rep 2012;2012. pii: bcr2012006523. Abbas A, Awan S. Rhabdomyosarcoma of the middle ear and mastoid: A case report and review of the literature. Ear Nose Throat J 2005;84:780, 782, 784. Chen SC, Bee YS, Lin MC, Sheu SJ. Extensive alveolar-type paranasal sinus and orbit rhabdomyosarcoma with intracranial invasion treated successfully. J Chin Med Assoc 2011;74:140-3. Bostanci A, Asik M, Turhan M. Pediatric sinonasal rhabdomyosarcoma: A case report. Exp Ther Med 2015;10:2444-6. Moretti G, Guimaraes R, Oliveira KM, Sanjar F, Voegels RL. Rhabdomyosarcoma of the head and neck: 24 cases and literature review. Braz J Otorhinolaryngol 2010;76:533-7. Callender TA, Weber RS, Janjan N, Benjamin R, Zaher M, Wolf P, et al. Rhabdomyosarcoma of the nose and paranasal sinuses in adults and children. Otolaryngol Head Neck Surg 1995;112:252-7.